A retiree revisits his youth when left an item in the will of an old acquaintance. In recent years the UK film industry finally got wise to the popularity of cinema-going among retirees. What did it do with this newfound knowledge? It gave us a string of movies patronisingly aimed at a demographic that came to be known as 'the grey pound'. Most were mediocre comedies in which the main source of humour was derived from seeing pension aged protagonists behaving like teenagers, and were peppered with awful gags about dodgy hips. The success - both critical and commercial - of Andrew Haigh's 45 Years in 2015 has proven an audience exists for serious drama featuring aging characters, and there are signs we may see the 'Oh my back!' style of comedies replaced by a new wave of films that give Britain's impressive roster of elder thesps mature roles worthy of their talent and experience. 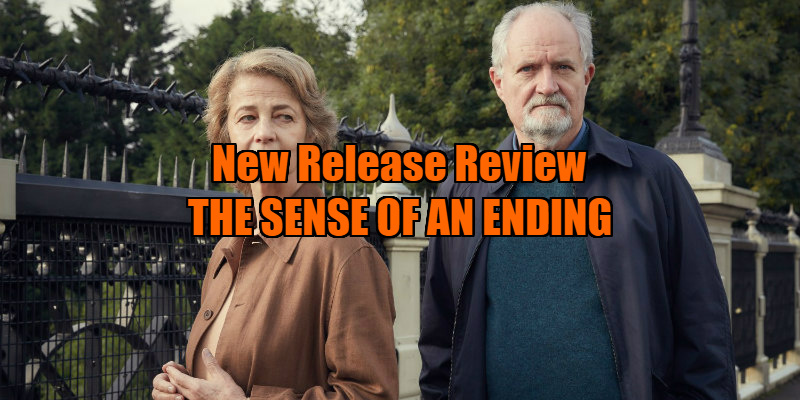 With a plot involving ghosts of the past and skeletons in closets, not to mention the presence of Charlotte Rampling among its cast, The Sense of an Ending may seem like a cynical cash-in on the success of Haigh's film, but it does just enough to stand in its own slippers. 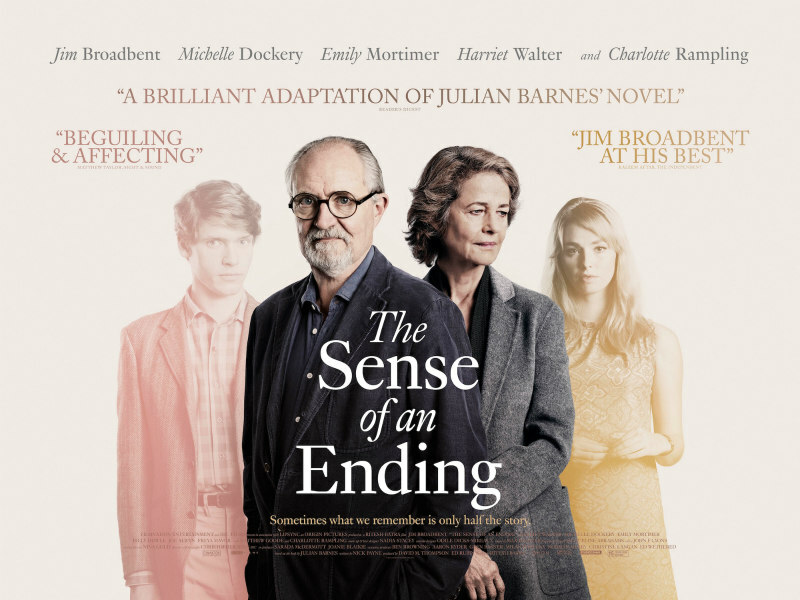 Adapted from Julian Barnes' 2011 novel of the same name, The Sense of an Ending is the story of Tony Webster (Jim Broadbent), a retired and divorced curmudgeon who spends his days tinkering in his camera shop and penning letters to the editor of The Guardian. His routine is disrupted when he receives notice that a figure from his past, Sarah Ford (played by Emily Mortimer in flashbacks), has left him an undisclosed item in her will. Upon investigation, Tony learns that said item is a diary that once belonged to Adrian (seen in flashbacks portrayed by Joe Alwyn), an old school friend who committed suicide as a young man, and is in the possession of Sarah's daughter Veronica (Rampling in the movie's present, Freya Mavor in the past), with whom Tony once shared a frustrating relationship. This all brings back memories of Tony's past - some fond, others he would have preferred remained buried. While relating the tale to his ex-wife Margaret (Harriet Walter), he begins to question the reasons for their break-up, while also rekindling his infatuation with Veronica. In terms of drama, The Sense of an Ending's narrative doesn't amount to much, but it's all in how the tale is told. There are essentially three storytellers at work here - Julian Barnes, whose source novel likely fills in some of the elements that feel insufficiently explored in this film's two hour run time; director Ritesh Batra, making his English language debut thanks to the breakout success of his 2013 Indian romantic drama The Lunchbox; and Broadbent, who spends much of his role recounting his character's past endeavours, if not always entirely truthfully. It's the latter who deserves most of the credit for making The Sense of an Ending slightly more than the sum of its parts. The veteran actor has arguably never been better in the sort of meaty role that's all too rarely afforded a star of his vintage. As his younger self, relative newcomer Billy Howle may not physically bear much of a resemblance to Broadbent, but his wide-eyed innocence adds to the sense of a life so long forgotten it may as well belong to another man. It's in the closing scenes that The Sense of an Ending becomes frustrating, as subplots are resolved in a fashion that feels like the scriptwriter suddenly became aware of his page count and decided it was time to wrap things up. As the present day incarnation of Veronica, Rampling is given little to do and only has one real dialogue scene, spending most of her screen time as the object of Tony's Vertigo-esque stalking routine. Her character is alluded to throughout, but we get a sense of who she might be as a person only through Tony's recollections. As a story, The Sense of an Ending plays like an invitation to read Barnes' book and fill in its gaps, and I couldn't help wondering if it may have proved more fruitful to adapt the novel as a prestige TV mini-series rather than a feature, though far more complex tales have been spun in run-times shorter than this. Luckily the film's stellar performances, led by a mesmeric Broadbent, go a long way to papering over its narrative cracks. The Sense of an Ending is in UK/ROI cinemas April 14th.